More power, more control and even lower distortion. Supported by the new “switched mode” power supply technology the soulution 701 mono­amplifier sets new standards in for uncompromising music reproduction and out­classes its predecessor the soulution 700 by far. Colossal power and breath taking performance. Never has an amplifier been so close to perfection, but at the same time the technology must be subordinate – and transparent – to the music. Letting you experience music in all its natural diversity and beauty. Two amplifier channels can be used either in mono-mode or in dual-mode. They work perfectly load stable and 100% level and phase accurate like in the soulution 711 with shortest signal paths and no excessive open loop gain as often associated with solid state amplification. The soulution 701 mono­amplifier is an ultra-fast and ultra wideband design (2 MHz/– 3 dB) and provides peak current ratings that would never be possible with a tube design. The unique concept of the soulution 701 mono­amplifier combines seemingly contradicting qualities. Precision, Velocity, Stability and Power. The soulution 701 is closest of all to this ideal. As monoblock design it is capable of up to 1,200 W of continuous power (into 4 Ω) and more than 12,000 W of transient power. More than enough to breathe new sonic life into even the most demanding, low-efficiency loudspeakers. To deliver these impressive power levels we have used bridged amplifiers. Optimized mech­anical construction ensures both amplifier circuits are perfectly balanced, sharing identical thermal conditions and ideal grounding. When no music is playing an intelli­gent control system auto­matically lowers the quiescent current. And when loudspeakers dictate bi-amping, the soulution 701 mono­amplifier can be easily switched to this mode. We think of it as tailor-made amplification. The new power supply of the soulution 701 mono­amplifier is based on audio grade “switched mode” modules. Four units with 600VA each combined with highend storage capacitors (> 1,000,000 µFarad) provide enough power reserves that allow the 701s reproduce even very complex music signals with ease. Circuitry that does not process audio signals should not be able to influence them. 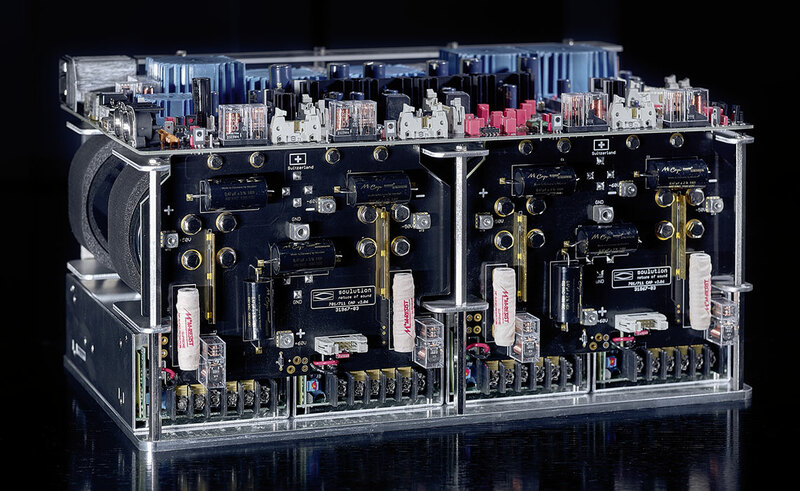 That’s why we use dedicated power supplies within each mono­amplifier for the ancillary stages. Power, mode and input functions are operated from front panel buttons. Power toggles between on and off states. Mode transfers control of turn-on to an associated preamplifier via soulution’s LINK system. Input selects the desired input and mutes the others. The monoamplifier 701 does have balanced and unbalanced inputs. With the balanced connection the input signal can be bypassed to another amplifier. Switches at the back of the amplifier allow to define the start options for the brightness of the display, the start-condition of the amplifier and the operation mode (mono or bi-amping).